“The Soviet Thermidor occurred 10 years to the month after the seizure of power by the first workers state, November 1927. Lenin and Trotsky were the two most instrumental actors in this one of the most momentous times of human history. 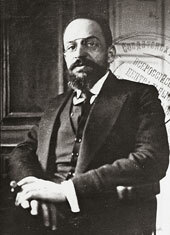 Lenin died 1/24, and Trotsky was one of the leaders of the Left Opposition that was removed from the Central Committee along with others, including Adolf Abromovich Yoffe, pictured here. The Left Opposition was committed to resisting the rightward march of Stalin and others, away from the genuine progressive ferment that characterized much of the new Soviet society in the early years despite the heroic efforts needed to resist the invading armies of 22 nations, including the U.S., intent on crushing the establishment of a workers state.